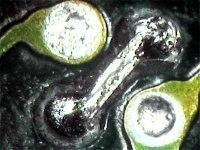 Figure1: Light area between pads is where connection is missing. In every industry there is a gap between conception and execution. It doesn't take long in this business to learn that ideas are very important, but they're usually the easiest part of the process. Putting a worthwhile idea into action can be exciting, challenging and humbling. To their dismay, one of our customers found a small but critical error. 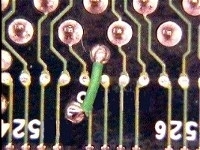 The ground plane that should have served as a return path for signals was missing between plated through holes in a section of their circuit board. Figure 2: Initial rework using a jumper wire. Thousands of boards were in the assembly pipeline, and thousands in the field, when a subtle disruption in the electronic operation of the final product became clear to the customer. As a result they discovered the assembly would not operate properly. See Figure 1. This problem existed between pads on a long row of closely spaced, plated through holes. Fortunately, after testing a number of different rework options, the customer was able to correct the fault using a short jumper wire. However upon viewing the rework with a wire, the end customer would not accept it. See Figure 2. Figure 3: Inner layer exposed by precision milling and a groove machined between locations. Was there a way to rework these board without the obvious surface wires? We reviewed the possibilities and came up with a process that was both reliable and repeatable. Here it is. The first step was to mill down to the layer requiring the connection. This was accomplished by a skilled operator using a precision, depth controlled milling machine. The inner layer copper was exposed; a delicate operation. 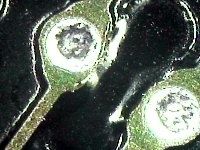 In addition, a shallow groove was machined in the circuit board surface to permit the new conductor routing to remain below the circuit board surface. See Figures 3. Figure 4. Close-up of new conductor at one location. The next step was an exercise in micro-dexterity. Our technician soldered new conductors across the gap. The tools and materials used included a microscope, solder, a fine tipped soldering iron and copper foil conductor .008" wide. See Figure 4. At this point the circuit boards were sent to inspection to ensure the solder joints and routing were per specification. After inspection the boards were returned to the technicians who filled the machined groove with high-temperature, thermo-setting epoxy. The epoxy was blended into the board's surface using a coloring agent. The results are shown below in Figures 5. Figure 5: Completed rework with area filled with color-matched, high strength epoxy. The repair was performed at 8 location on each circuit board. It was performed reliably and economically. The gap between conception and execution was bridged. On to the next project!